Home About Us What is Cogeneration? Cogeneration, also known as combined heat and power (CHP), is the production of electricity and heat from a single fuel source. 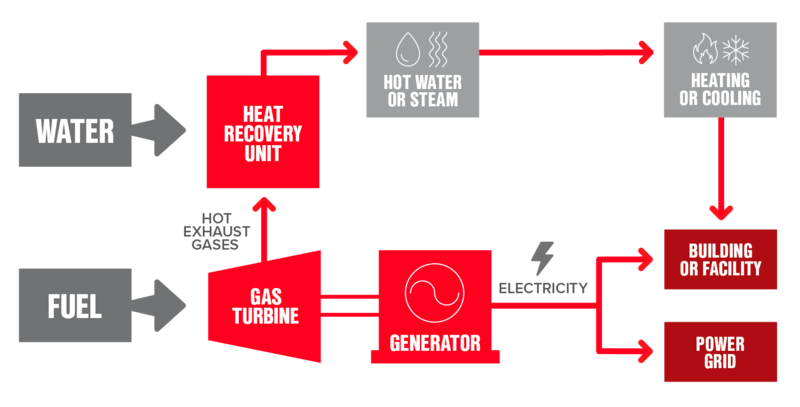 Powered by a gas turbine, a cogeneration system is a highly efficient way of capturing heat which would otherwise be lost during the production of electricity and converting it into useful thermal energy. A cogeneration system is both flexible and reliable and, because of its efficient use of energy, industrial-scale cogeneration/CHP is more economical and environmentally attractive than conventional fossil fuel power plants. A gas turbine-powered industrial cogeneration plant using generator sets manufactured by Centrax can be located close to electricity consumers, thereby reducing transmission line losses. As an energy generation process, cogeneration/CHP is fuel neutral. This means that a CHP process can be applied to both renewable and fossil fuels. The specific technologies employed and the efficiencies they achieve will vary, but in every situation CHP offers the capability to make more efficient and effective use of valuable primary energy resources. CHP plants generally meet local energy needs – certainly heat, but also power and, increasingly, cooling.